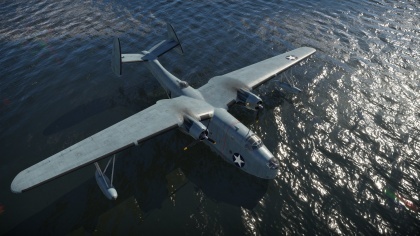 The PBM-3 "Mariner" is a rank II USA bomber with a battle rating of 3.0 (AB/RB/SB). It was introduced during Update 1.85 "Supersonic" as part of the Sea Voyage event that ran from 21 February to 11 March 2019. 405 450 340 ~?? ~? In the mid 1930s, the U.S. Navy was eager to replace their outdated flying boats with newer models. In order to do so, the Navy started a competition between aircraft manufacturers, whose winner would receive a production contract with the Navy. The Martin company submitted the designs on their four-engine Model 160 aircraft, which didn’t garner any significant interest from the Navy. However, Martin continued to work on the design, reworking it into a two-engine aircraft, designated Model 162. This design proved to be a lot more successful, with the Navy quickly ordering for a prototype of the aircraft to be produced. Designated XPBM-1 “Mariner”, the prototype conducted its maiden flight in February 1939. Following successful trials, the aircraft was adopted by the USN as early as September 1939 and order into production. In late 1940, Martin received a large order for more flying boats to be manufactured. However, with the company’s production capacity being reached, construction of these new machines was delayed. In the meantime, the PBM was further improved by installing new engines, increasing overall size and doubling payload capacity. The new PBM-3 Mariner entered production in 1941, the first batch of 32 vehicles entering service in 1942. The Mariners primarily served with the USN as coastal patrol aircraft before the outbreak of WW2. However, after the United States’ entry into WW2, Mariners were used in the anti-submarine role in the Atlantic and also took part in operations in the Pacific Theatre. 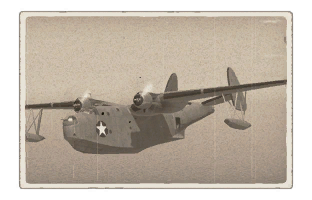 The PBM-3 Mariner flying boats of the third series served very briefly during WW2, as nearly all PBM-3s from the first series were converted into unarmed transport machines, shortly after their construction. Nevertheless, the aircraft proved to be very successful and further models were built in large numbers - in total more than 1360 Mariner vehicles of different modifications. Mariners were also used in small numbers by Great Britain, Australia, Argentina, Uruguay and the Netherlands. The last Mariners were phased out of service during the 1960s, being replaced by newer aircraft. This page was last edited on 11 April 2019, at 20:23.